Recovered and ready, Chan Marshall a/k/a Cat Power returns as promised with a new set of dates, same select venues. Tickets for all previous shows remain valid for the new dates with a on-sale date of Friday 4th March set for all remaining tickets. The Georgia-born singer / songwriter has been a long time fan of Australia – its audience and its people – dating back to 1997 and her first visit at the behest of Dirty Three / Xylouris White drummer Jim White. A visit that also saw Chan record her album Moon Pix (including breakthrough track Crossbones Style) with both White and Dirty Three guitarist Mick Turner. Follow-up visits have included both band and solo excursions and have included festival slots at Meredith, Golden Plains, MONA FOMA, Sydney Festival, PIAF and headline shows in some of the country’s premier venues. More recently Ms. Marshall, alongside Jakob Dylan (son of Bob), has lent her stunning vocals to a duo-rendering of You Showed Me, a lost classic from sixties mavericks The Turtles. The track is a feature of Echo In The Canyon an all-star indie tribute to the California folk-sound and artists of that era including The Beach Boys, The Byrds, Buffalo Springfield, Love and of course, The Turtles. The tribute includes live performances and an album (due in 2016) both of which feature Cat Power, Fiona Apple, Beck, Jakob Dylan and others. You Showed Me is the first taste of the So-Cal tribute. 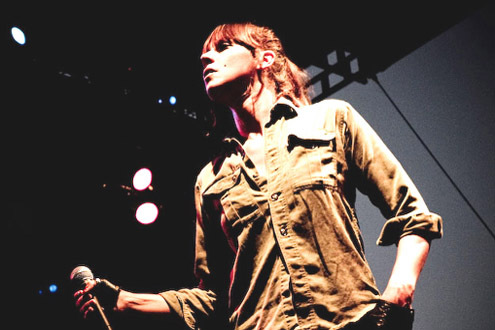 Continuing the sixties vibe, Cat Power also recently provided the voiceover to Janis, a movie-length documentary about troubled female rock-pioneer Janis Joplin – endorsed by the Joplin estate – which made its debut at the Venice Film Festival this past September. Additionally, Chan has added her vocals to a character from animated TV Show Adult Swim. Oh, and in between all this and the writing of new material, Ms.Marshall gave birth to a beautiful baby boy. Don’t miss this rare opportunity to see Cat Power Solo: Up Close and Intimate, playing songs old and new ahead of new album recording this autumn.